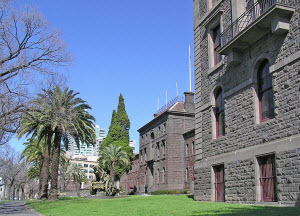 The earliest buildings at Victoria Barracks were built by soldiers in the late 1850s, with the original bluestone buildings being constructed between 1856 and 1872. A large extension was made to officers' quarters in 1917 but with the growth of service personnel and civilian staff at the beginning of the Second World War, space was at a premium. In 1940, a five story red brick extension - 'N Block' - was erected behind the original 'C Block' to house the administrative headquarters of the Navy and the Air Force. The most significant room in the Victoria Barracks was the specially fitted out War Cabinet Room at the other end of the corridor from the offices of the War Cabinet Secretariat.